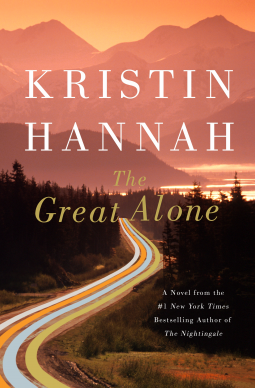 What I Say....This was one of my favorite Kristin Hannah books. I wasn't quite sure what to expect, and I'm no nature lover so the thought of moving not just to Alaska, but to off the grid Alaska, had me grinding my teeth. What kind of parents do that to their child? The answer is crazy ones. Ernt has come back from the Vietnam war changed. His wife is still madly in love with him and goes along with the frequent moves that come with the frequent job losses, and the paranoia that leads to quick anger and lack of sleep for the whole family. When Ernt receives a letter from the family of a dead Army buddy, he doesn't hesitate to uproot his entire family to move into a house sight unseen. No running water, no bathroom, no electricity, no nothing. But Leni and her mother Cora make the best of a bad situation. This was crazy to me, it's like it never occurred to the that there was any other option. Although this was during a time when a woman couldn't have a credit card unless her father or husband co-signed for her. Complete madness. The years pass, and Leni develops an attraction to Matthew Walker, the richest boy in town, an attraction that is reciprocated. But her father's paranoia has continued to grow, and his envy towards the Walker family is all consuming. The means that Leni has to sneak around, not an easy task in a tiny town. The best part of Kristin Hannah books is that they usually follow a large span of their character's lives, which I find immensely satisfying. Every life has good times, bad times, births, deaths, and messy, messy relationships. This book covers all of these chapters of life, set in the wilds of Alaska, where the landscape presents as much danger as the people who proclaim to love you.